I’m a firm believer in quality over quantity. Okay, maybe I do both quality and quantity. But, hey, how can you not justify multiple quality purchases? Whether it’s fuel for my body or my mind, I’m going to make sure it’s a good investment. And, that includes my sweaty gear. When you lead an active life style, you want comfortable, functional, cute gear that’ll last through your many sweaty adventures. Runners…you MUST check these shorts out. There are MULTIPLE reasons I’m in love with these shorts. I literally do ALL my long runs in these shorts. They’re perfect for race day, too! Gone are the days of carrying your belongings in your hand…or bra. …and more than one pair. Your feet do A LOT for you. Treat them right. Whether you’re a runner, weight lifter, CrossFitter…whatever…pay the money for good pairs of shoes. Also, do your research on shoes. And I don’t just mean read other people’s reviews. While this is helpful, everyone’s body is different and has different needs. Just because a shoe did/did not work for them doesn’t mean it won’t work for you. Test the shoes out, and see how your body reacts to them. My mat is my everything. Split Pea has taken me adventures my runs couldn’t even dream of. The Mat absorbs sweat and stays in place. I can’t imagine perfecting my downward dog on any other type of mat! My Towel Mat is also fabulous. A holiday gift from my boo, it has been the perfect accessory for hot yoga, tanning pool side and relaxing on a sandy beach. It’s easy to wash…and it’s the perfect length! As I’ve added long runs back into my weekly routine, staying proper fueled is SO important. I made sure to invest in a mini water bottle from Bull City Running Company (also where I purchased my adrenalines!) I just squeeze and the water pours perfectly into my mouth. Plus, it fits perfectly into the pockets of my What the Sport Shorts I bragged about earlier. I’ve also started consuming carbs while running. My body burns through food quickly, so it’s vital I keep it energized. I’m loving Clif Shot Bloks. They give me the burst of energy I need as the miles add up on my runs. Your body needs fuel all day every day…not just when you’re working out. My nutrition is without a doubt what keeps me sweating right. If you’re just fueling up the day before/day of…you’re doing it wrong. How can you expect your body to do all that it does (like live…) without the proper nutrition? Just like my gear, I invest in my food. Sure, sweating right can get pricey. But, when you’re treating your body to quality products…you can’t go wrong! Yesterday, I had the pleasure of venturing through downtown Durham. 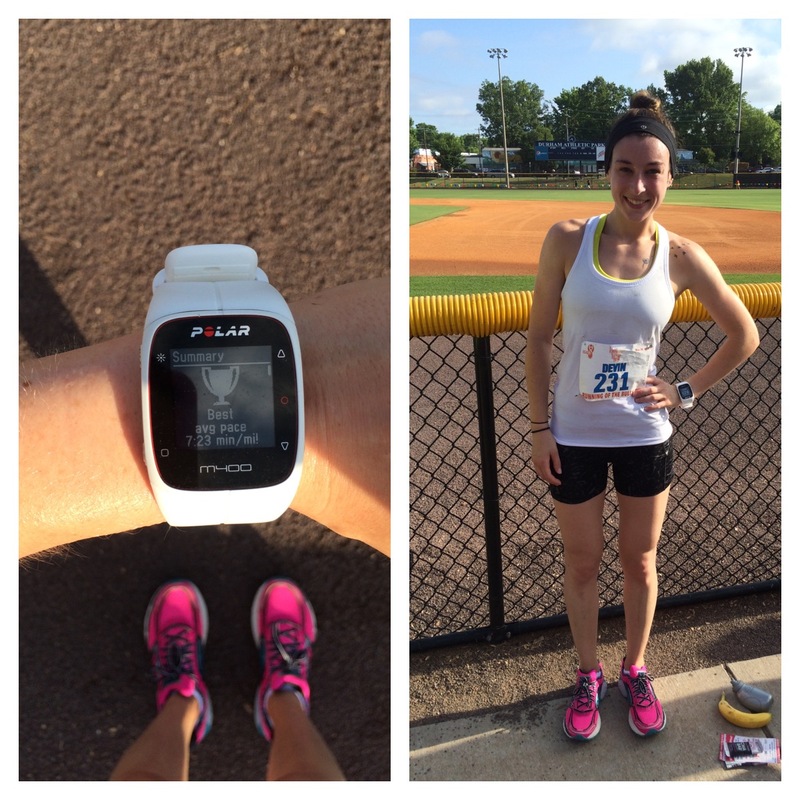 Despite the high humidity (90% to be exact…) the race was a success! 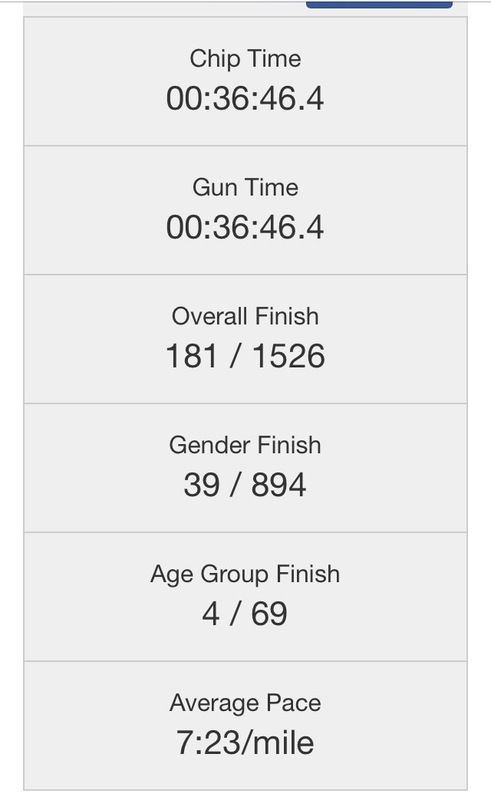 And, although, I’m very proud of my pace, and overall placement for age group and gender..I’m measuring the success of this race in a different way. I know what pace my body is capable of. I commit to long distance runs every Saturday morning and have easily sustained an 8 minute pace for 9 miles. I didn’t go into this race with a pace goal. I didn’t set myself up to meet an expectation. I wanted to soak up my surroundings. My focus was to be aware of the bliss and gratitude that surrounded me when I ran. I centered on the sights, the sounds, the scents that were present; that were a part of this journey with me. At one point in the race, I told myself to keep my head up. And I did just that. I looked up, peered around at the sea of people surrounding me and soaked up the empowerment that came from recognizing I was one small part of this big community. Pretty powerful stuff. So rather than trying to control my pace, my body, my breath…I just let it be. I ran. I smiled. I enjoyed my time on the road with my fellow runners. I truly believe this is why I had a successful run. There are many components to living a balanced life style. Creating a balanced mindset is probably the most necessary, and difficult to achieve. Balanced nutrition is key, especially for athletes. I planned my meals the day before the race to allow myself to have most of my carbs at night. Carbohydrates provide stored energy. So, I had strawberry banana protein pancakes followed by some oatmeal for dessert. And water. LOTS of water ALL DAY LONG. Coffee. And more water. Followed by Shakeology with half a serving of whey added to it. I’m the odd one out who has to eat right before a work out. Shakeology before my runs has proven to work for my body. It provides me with TONS vitamins and minerals. It leaves me feeling energized and ready to go! 2 Chia Bars (1 acai berry, 1 chocolate peanut butter), 1 banana, 1 sesame seed bagel with 2 egg whites, 1 cup of greek yogurt with a scoop of strawberry whey protein and 1 cup of protein fiber almond flax granola from Whole Foods. I. Could. Not. Get. Full. When your body burns calories, it’s VITAL to restore those calories. I may not have gotten full…but I also never got that post race crash…because I fueled my body properly! Restored my body with carbohydrates and rebuilt muscle with protein!